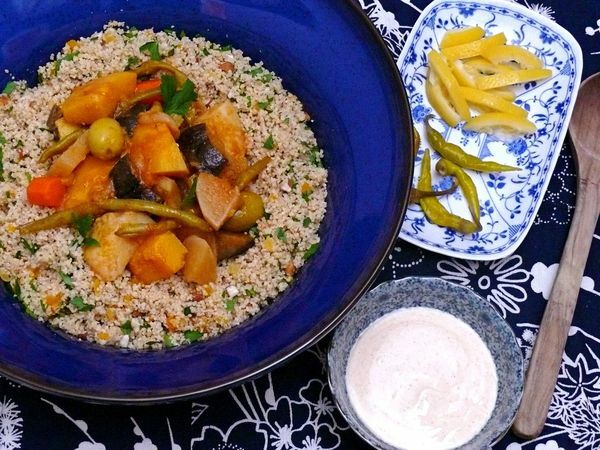 Tagine is a stew as easy as any other to make, but I hardly ever attempted it at home, preferring to eat it at a restaurant, strongly preferring to eat it on travels where Morrocan cuisine is established. The reason, the version I made at home was never as good. The reason for that? No preserved lemons until last week. I never bought them because I knew it would be so simple to make them once I got around to it. You can either buy or preserve your own. I recommend the latter so that you can serve them, cook with them or simply snack on them at will. And you will. We’ve gone through 2 whole lemons since opening this jar on the weekend and only one half of one went into this tagine. 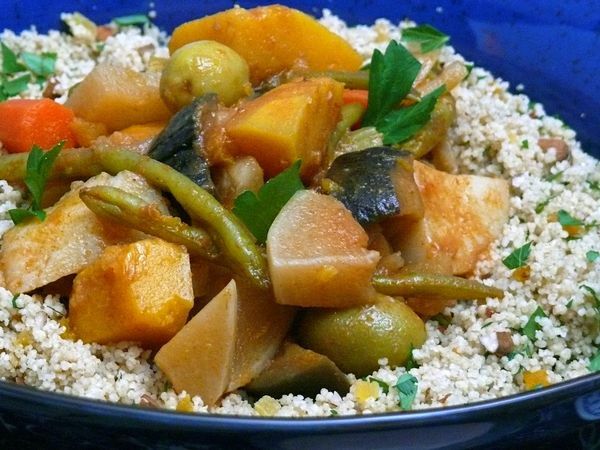 The thing that sets vegetable tagine apart from a vegetable stew, aside from the preserved lemons and the harissa (although you could use any chili paste really) are the spices. I’ve seen recipes that call for cloves and cardamom but I can take or leave those, personally. What I think makes the flavour of tagine absolutely distinct is the cumin and the cinnamon. Those are mandatory, in my opinion. Other than that, make all kinds of substitutions–use your favourite vegetables (ideally root vegetables that won’t water down the flavour) and of course, use a healthy squeeze or more of lemon juice if preserved lemons are out of reach. Tagine refers the conical clay cooking vessel traditionally used to make the dish also referred to as tagine: a Moroccan meat or vegetable stew. Tagine lids are tall and conical and sit snugly on top of a wide, shallower pot that allows for even cooking. The steam flows up the cone, the heat circulates and the condensation falls back to aid in cooking and flavouring. If you don’t have a tagine, simply use a large pot with a tight-fitting lid and plug any steam vents with a piece of foil. Resist the urge to uncover unless necessary to add ingredients or check seasoning. Sweat the onions and garlic in the olive oil over medium heat in a large, deep (non-aluminum) pot until they are soft, stirring occasionally so that they don’t brown. Add cumin, paprika, cinnamon, saffron to the onions and garlic and toast for under 1 minute, stirring. Add the broth, the tomato and harissa pastes, the ginger, mix well and cook for 1 minute. Add the lemon, squash, potatoes, turnips, parsnips, carrots and eggplant and stir well. Bring to a simmer, lower heat, cover with a tight-fitting lid, blocking any steam holes with a piece of foil, and cook for 20 minutes on a steady simmer, without removing lid so the steam can aid in cooking. Then remove lid allowing condensation to fall into pan, taste and adjust seasoning with salt, remembering that the olives will be added next. Rinse and drain olives and add them to the pot. Add green beans, mix well, cover and cook for another 10 minutes at a steady simmer. Taste and adjust seasoning as needed. The vegetables should be fork-tender, but if the centre is undercooked, cover and cook for another 5-10 minutes as needed. While the tagine is cooking, add the couscous and about 1/2 tsp of salt evenly to the bottom of a wide, bowl (it can also serve as your serving dish) and cover with boiling water leaving a small pool of water sitting on top–roughly 2 1/2 c of water. Let it sit, undisturbed, for about 5 minutes at which point the water will be completely absorbed and the couscous will have tripled in volume. Rake the couscous with a fork to separate and fluff it up, then set it aside to cool. When ready to serve, mix the parsley, apricot and almonds through the couscous and create a well in the centre, pushing the couscous up the sides slightly. Scoop the finished tagine into the centre and ladle some of the sauce on top. Garnish with the reserved parsley leaves and serve.